With so many new things in Detroit grabbing the spotlight, it’s nice to go back and visit things and places that made Detroit the architecturally rich, diverse, amazing city it is today. 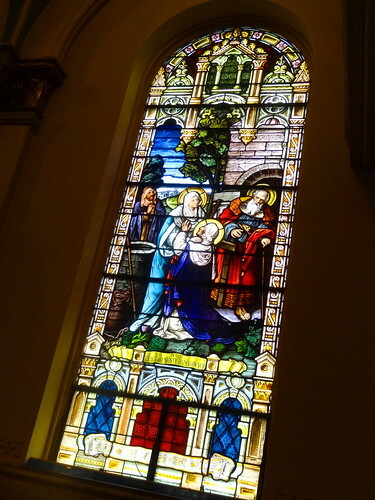 A good place to start is one of the many historic churches that have stood the test of time; today we are visiting St Hedwig Roman Catholic Church on Junction in SW Detroit. 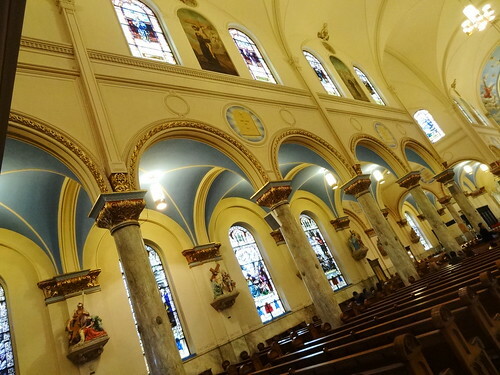 St Hedwig was the third Polish parish established on Detroit’s west side, the first service held in this building was November 30, 1916, Thanksgiving Day. 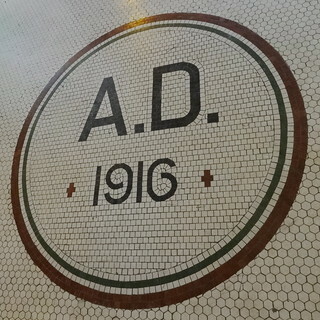 Here’s a little history. 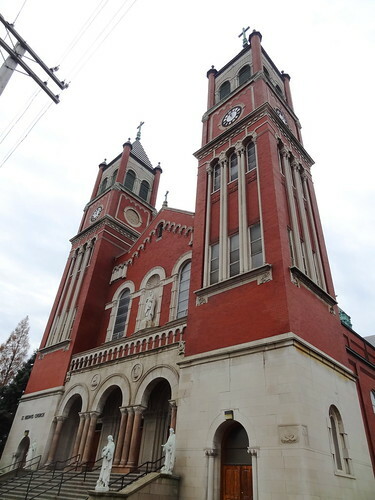 St Hedwig was founded in 1903, From 1910 to 1914 increasing numbers of Polish immigrants settled in Detroit, the parish quickly outgrew their building, in 1911 Architect Harry J Rill designed the church we are standing in today. 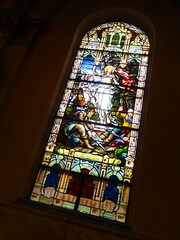 In 1917 the Vorrler-Holtkamp Sparling Organ Co. of Cleveland completed the installation of the pipe organ, in 1918 Daprato Statuary Co, installed the stained glass windows. In 1928, for the Silver Jubilee, 3 bells were purchased and hung in the south tower, at the same time five clocks were installed in both towers. 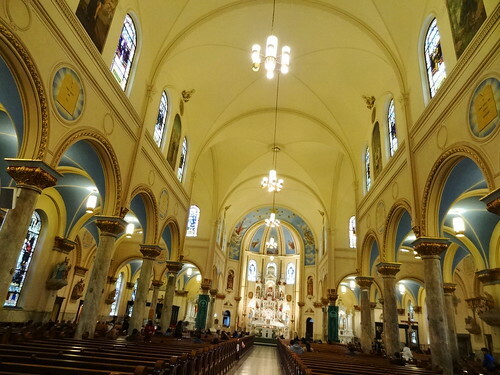 Hispanic population grew three-fold from 1993 to 2003 in southwest Detroit, the first Spanish mass was added in 2003. 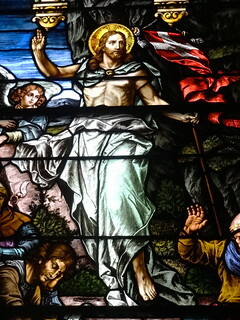 In 2013 St Hedwig and St Francis D’Assisi merged into one new parish. 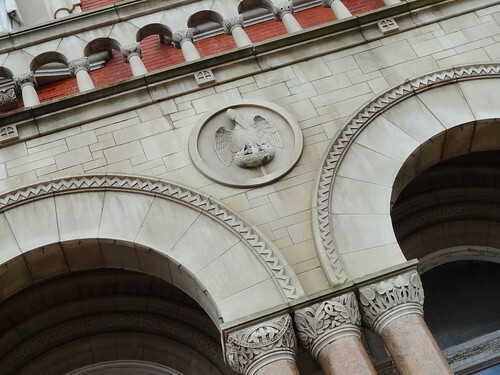 The exterior is a combination of red brick and stone; arches, columns and windows are grouped into three’s, statues stand near the main stairs, wood doors grant us access to the interior, a tile medallion on the vestibule floor reads A.D. 1916. 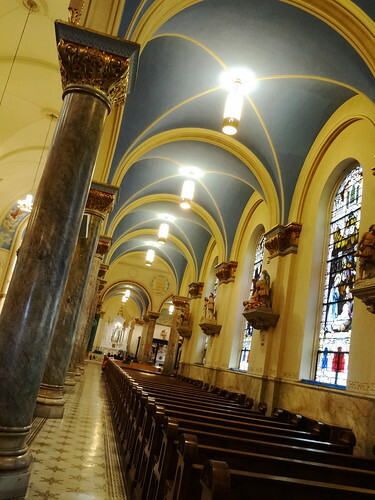 It is nearly 30 minutes before mass begins, all of the lights are not on yet, our attention is immediately drawn to the stunning high altar, aisles leading to the front are made of tiny tiles grouped into fanciful patterns. Dark colored wood pews rest upon a wood floor, light seeps through the stained glass windows. 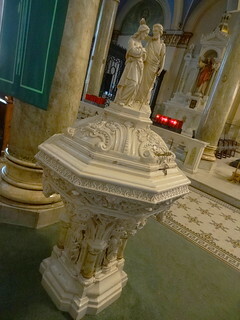 As we near the sanctuary we see the baptismal font, a work of art in itself, the pulpit was installed in 1978 along with the main altar to comply with Vatican II, there it is, the High Altar! 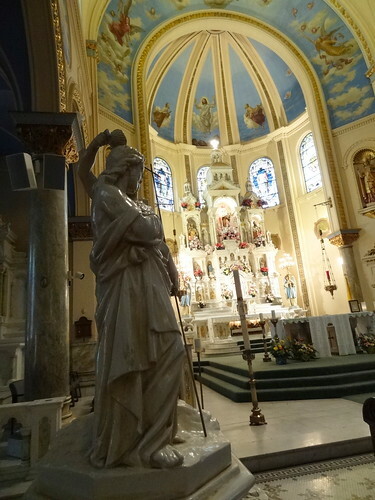 The High Scagliola Altar is an original work of the Daprato Statuary Co of Detroit, they also made the other statues and the stations of the cross. 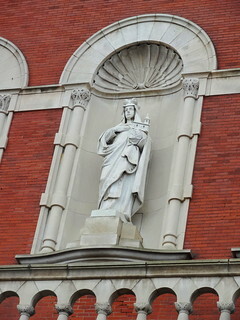 On the upper tier, St Hedwig is at the high, St Peter and St Paul, on her sides, the Evangelists occupy the middle tier while the lower tier contains the Tabernacle. Large-winged angels flank the lower tier holding elaborate gilded lights, at the base of the altar rests a rendition of the last supper. 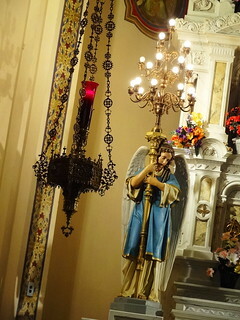 Here the ceiling soars into a high Gothic arch, murals surround it, sanctuary lamps hang from delicate, ornate chains. 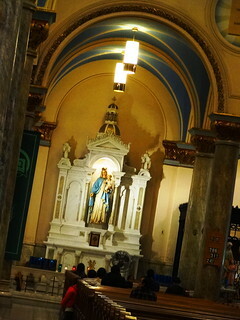 To the right and left of the main altar are the Blessed Virgin Mary Altar and the Sacred Heart of Jesus Altar, the St Therese Altar is enclosed by a wrought iron gate as is the St Francis Altar on the south side, all are lovely. 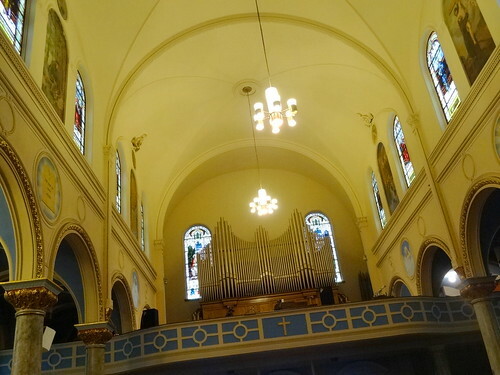 Facing the back of the church the first thing we notice are the pipes in the organ loft, there are over 2900 pipes in the organ that imitate instruments such as tubas, clarinets, oboes and trumpets. 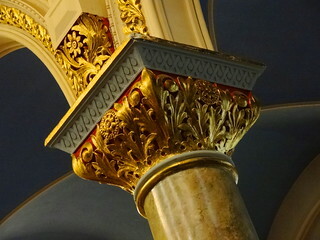 Columned arches line the nave, capitals are highly decorated in gold leaf, the ceiling is solid ivory in color, making details such as murals and windows stand out. 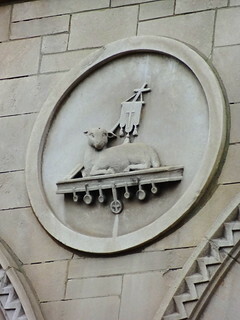 Stations of the cross are mounted to side walls, each one tells a story; the lights have been turned on, it is clear these are not the original fixtures. Filled with light, the church has come to life, parishioners are filing in through front and side doors, today’s mass is in Spanish. We drive over to Vernor and park in front of the familiar yellow awning belonging to Taqueria Nuestra Familia. For over 11 years they have been serving up family recipes handed down through generations, the restaurant is packed! 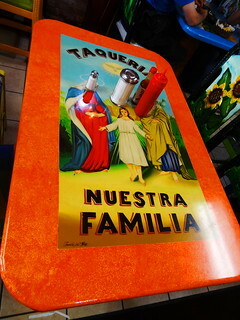 We are seated at a table near the front and close to the picture of the Holy Family; the menu offers the usual tacos, tostadas, tortas etc. What brings people in is the variety of fillings: Beef Head, Beef Tongue, Beef Tripe, Chorizo, Lomo, Carne al Pastor, Carne Asada and of course, chicken. Our server arrives with a basket of tortilla chips and 3 homemade salsas; a creamy green one, the standard fresh tomato and a golden one I suspect is made from roasted tomatillo’s, it has a nice spice to it. We place our order and try not to finish off the chips. The space is filled with families out for a Sunday meal, it’s not unusual to see three generations sitting together at a table, infants are passed from one family member to the next. The mood is light and cheerful as is the decor; tables and chairs are finished in bright pink, yellow, blue, orange and lavender. 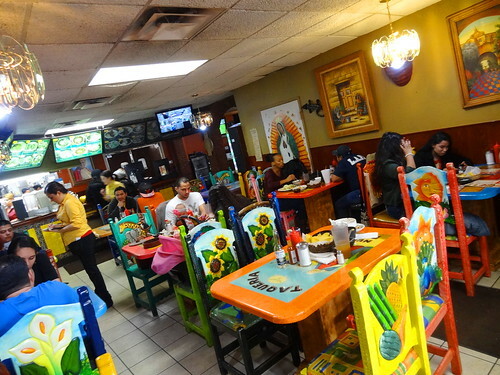 Chair backs are decorated with scenes of birds, flowers, fruit and Mexican themes. 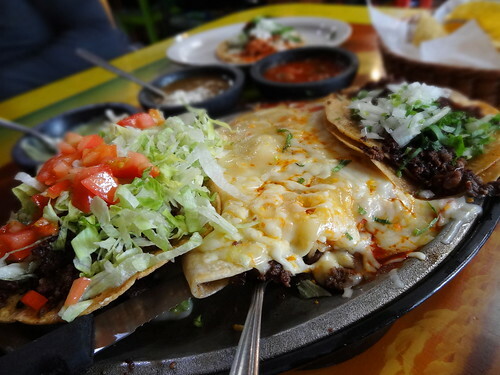 Before we know it our meal arrives, we are having the combination plate of a taco, tostada, burrito and two enchiladas, we were hoping to try a few different fillings, but the same meat comes in each, today we ordered the carne asada. I used a different salsa on each to give it some variety, all was good. 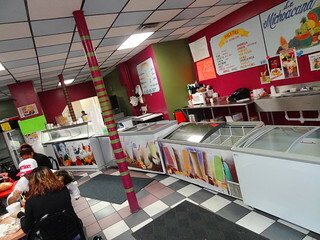 Heading east on Vernor we stop in at Neveria La Michoacana for dessert. 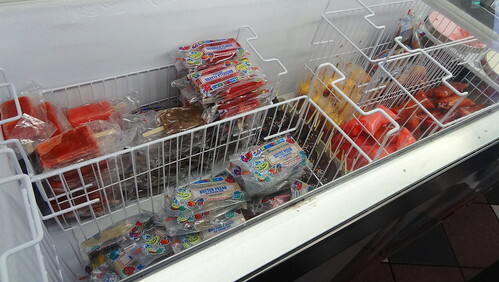 Serving up homemade Mexican popsicles (Paletas), aguas frescas, chocolate dipped bananas, fresa y crema and ice cream, the shop does a good business. Walls are magenta and green, ceiling tiles are blue and white, coolers and chest freezers with pictures on the front line the counter. There’s a short line so we have time to look around. They offer snack items like nachos made with Doritos, or hot Cheetos and Cheese, fresa y crema (strawberries and cream). After studying the menu I order a mango aguas frescas, the owner reaches into a cooler packed with clear square bins filled with icy, colorful liquids and fills my cup, tasty and refreshing it reminds me of punch. Be sure and ask for a sample of the Cajeta, it’s pink and made with a combination of fruit and milk, nice and sweet! 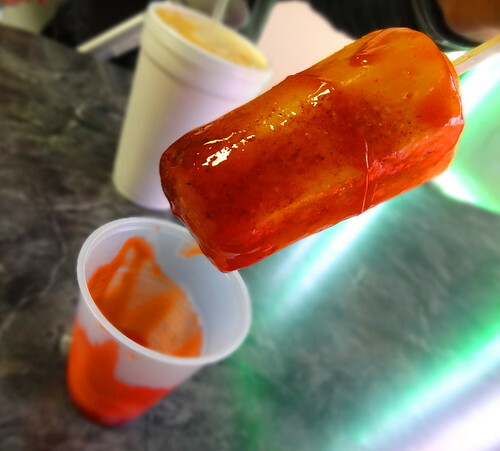 After much debate Kris orders the mango paleta de chile, a housemade mango popsicle sprinkled with Tajin, placed stick up, in a cup of Chamoy– a tart sauce made from fruit pulp, lime and spices; the result a sweet, spicy, tart, frozen treat.